Image Graphics & Signs started in 1993 as 1 Hour Signs. It is a family run business owned and operated by Muslim Hooda. He has an MBA from Adelphi University in New York and has a wide range of experience in different areas of management. This ranges from restaurant management to project management, marketing, budgeting and client services. He is actively involved in community services and different organizations such as The London Chamber Of Commerce, The Home Builders Association etc.. He regularly attends trade show conferences and seminars all over the world to create a deeper understanding of the industry and to be able to offer a variety of products and services to his current and potential clients. One Hour Signs was the second franchise in Ontario which then grew to eleven different locations across Southwestern Ontario. In 2001 the franchisor sold the rights to the franchisees and hence they ended up becoming the largest independently owned dealer network in Canada. Image Graphics & Signs understands the importance of creating a brand image for your company and offers much more than signs. Our in house design facility uses state of the art graphic design software to prepare custom artwork to meet your specific requirements. In 2004, we a second division called eMage Graphics Plus, whose primary function is meshing the creativity with the finished product. 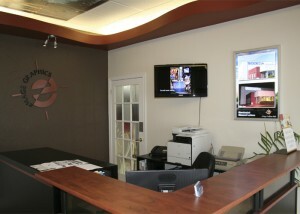 Image Graphics & Signs currently has 5 full-time employees as well as additional staff and installers on a need-basis. Our store premises is approximately 3000 sq.ft with a bay area for vehicle graphics. Our facilities house a UV Flat-Bed Printer, an Eco-Sol roll-to-roll printer as well as several vinyl cutters. Our large format digital printing is created by the latest digital imaging technology that allows us to produce the highest quality prints to enhance your image. We also offer a variety of services such as routing, engraving, sandblasting and offset printing. Image Graphics & Signs offers professional, consistent, creative and personalized service to each client we are privileged to serve. We will recommend the right products for your specific use. We use modern sign making equipment and techniques to create a strong business image for your company.